Home design is not just how your house looks on the inside and outside, but also involves your garden. Now that summer is in full swing, many people are spending more time outside. It’s the perfect time to add some focal points to your garden, such as an arbor or stone potting shed. 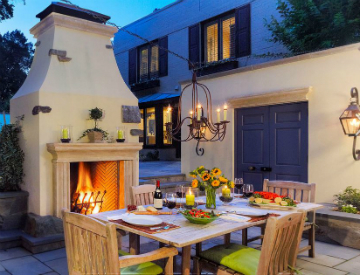 Many people are moving towards doing a lot of their living outside with plenty of outdoor living trends coming up, and outdoor living rooms and outdoor dining rooms are becoming very popular. The outdoor dining room provides the perfect opportunity for a dinner under the stars with friends and family and time to enjoy the evening breeze. The dining room can be permanent, such as under a veranda or patio, or can be placed wherever you have a flat piece of grass or paving for the duration of the evening. You can also consider making a secluded outdoor room in your garden and use that for a variety of entertaining purposes. Your options for outdoor dining are endless. Furnishing your outdoor dining room will be similar to furnishing an indoor room, but remember that because it’s outside, it should be relatively light and airy, so neutral and natural tones are ideal for this type of setting. If you decide that you’d like to have a permanent structure in place for outdoor living to meet the current outdoor living trends, consider hiring a contractor that you can rely on to do the best possible job. Tiefenthaler are an architectural firm that specialize in housing design, development and construction and will ensure that you’ll have an outdoor room that you’ll be proud of. If you’d like a consultation regarding the construction of a new outdoor room, contact us today to arrange a consult at a time that suits you.